As the saying goes, "Every super hero needs a Super-Pet!" Well, maybe that isn't a real saying, but it is in the world of DC Comics. With the 2016 Funko DC Super Heroes and Pets Mystery Minis debut release, fans get the chance to collect their favorite hero and matching pet. The team of super-powered pets isn't new to the DC Universe, making their first appearance in Adventure Comics #293 (1962). However, in recent years the pets of DC's heroes and villains have been illustrations in chapter books for young readers by Art Baltazar. Super-Pets even had a short-lived Saturday morning cartoon. With at least 200 heroic and villainous pets, discovering which animal pairs with their famous or infamous owner is quite comical (no pun intended). In case fans have somehow missed the animal sidekicks, 2016 Funko DC Super Heroes and Pets Mystery Minis provides a small look at the pairings. The set offers a few of the Supes who are known to have pets: Aquaman & Storm the Seahorse, Supergirl & Streaky the Supercat, and Superman & Krypto the Superdog. Surprisingly, a certain Caped Crusader owns a pet, too! That is not a typo, Batman and his Bat-Hound (not a typo either), Ace, wear similar masks. Of course, Ace's collar is the Bat Symbol. Combining the good with a little evil, villains do make an appearance on the checklist. Harley Quinn, resembling her Batman: The Animated Series Pop! figure, is paired with her pet hyena, while The Joker is matched up with Joker Fish (also known as Laughing Fish). Lastly, Catwoman & her cat are also included among the villainous list. 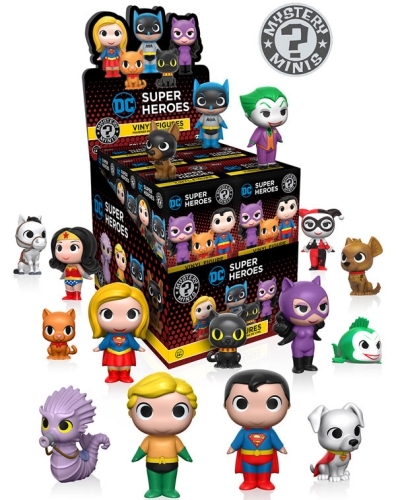 2016 Funko DC Super Heroes and Pets Mystery Minis come in a blind-box format, keeping the contents a surprise until opened. There appear to be only 16 minis in total, as no announcement for any exclusives has been released as of yet. However, given there are just 12 figures per case, collectors will need more than one case to complete the set. The specific odds are not currently known but we will update as details emerge. Each 2016 Funko DC Super Heroes and Pets Mystery Minis figure stands approximately 2 1/2" tall but the pets are noticeably smaller.